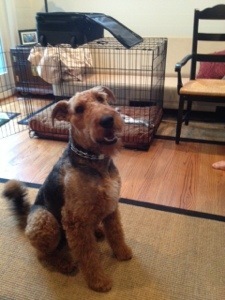 Blue is a fantastic young Airedale boy. He is 3 years old. Blue loves attention! He is so loving to his owners and people who take interest in him. 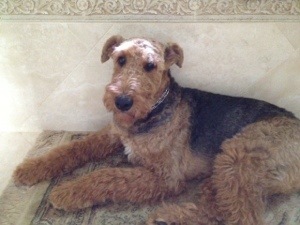 He is a smart Airedale and needs a family that recognizes the true Airedale terrier- both in training and exercise. Blue has been working with a trainer for a year on his obedience and to have excellent manners. He knows sit and down. He can bark and act out toward trucks, loud motor cycles and sometimes unknown dogs. He does play nicely with neighbor dogs and he lives with a smaller dog. Blue is the alpha in the pack, he just cannot be alpha over the humans! Blue is a strong boy when walking on the leash but he enjoys his neighborhood walks. Blue needs a lot of exercise to keep him happy. He would enjoy living with a runner or dedicated walker. In addition, he needs a fenced yard. Blue is 70 lbs. He is up to date on all vaccines. Blue has a natural tail. 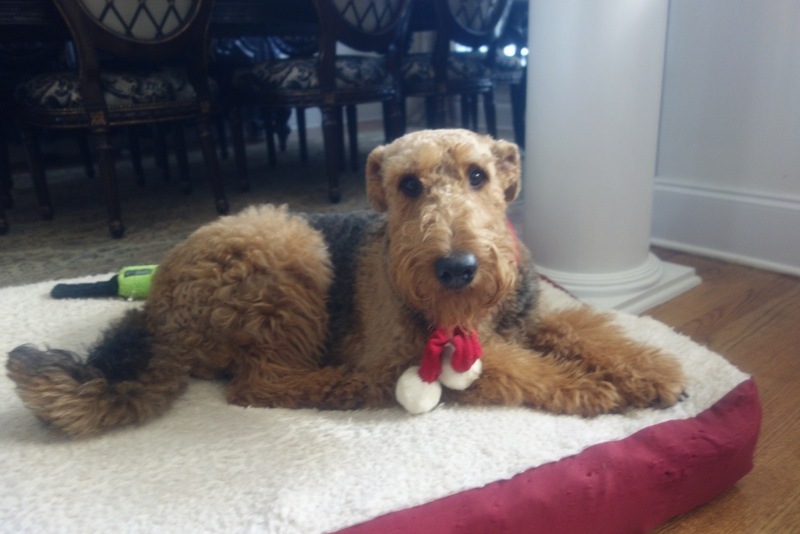 Rescuing Airedales since 2000, in the Carolinas, Tennessee, Georgia and Alabama. Click here to sign up for our email newsletter. Without your support and generous donations there would be no safe harbor for these sweet dogs. Amazon donates a percentage to ARG with every purchase. 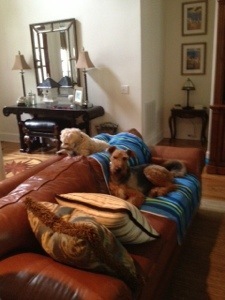 Go to Amazon Smile and choose Airedale Rescue Group of South Carolina as your charity. For behavioral and training assistance, contact ARG’s animal behaviorist, Corinna Murray, DVM, CPC. Dog trainer, Cindy Green in Florence, South Carolina, offers group and personal training at Woofers. Contact Cindy on Facebook. 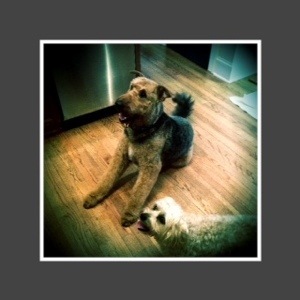 Exclusive Airedale Art by the late Polly Siegel at Cafe Press.